If we are afflicted, it is for your comfort and salvation; if we are comforted, it is for your comfort, which is experienced in the endurance of the same sufferings that we suffer. If we suffer, it is for your comfort and salvation. If we are comforted, it is for your comfort when you patiently endure the same sufferings that we are suffering. But if we are troubled (afflicted and distressed), it is for your comfort (consolation and encouragement) and [for your] salvation; and if we are comforted (consoled and encouraged), it is for your comfort (consolation and encouragement), which works [in you] when you patiently endure the same evils (misfortunes and calamities) that we also suffer and undergo. But if we experience trouble, it is in order [to provide] for your comfort and salvation. Or, if we are comforted, it is in order [to provide] for your comfort [also], which enables you to endure patiently the same sufferings we experience. If we are afflicted, it is for your comfort and salvation; and if we are comforted, it is for your comfort, which is effective in the patient enduring of the same sufferings that we suffer. but whether I am afflicted, it is for your consolation and relief, which is effected by your perseverance, patiently enduring the same sufferings which I also undergo: or whether I am comforted, it is for your consolation and relief. But if we are troubled it is in behalf of your consolation and salvation; if we are comforted, it is in behalf of your consolation, working in you through the endurance of the same sufferings which we also suffer. If I am in trouble, it is to bring you comfort and salvation, and if I am comforted, it is for the sake of the comfort which you experience when you steadfastly endure such sufferings as I also have to bear. 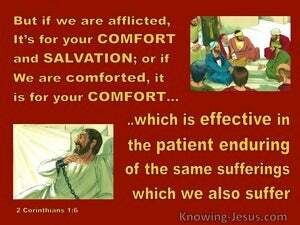 And whether we are afflicted, it is for your comfort and salvation; or whether we are comforted, it is for your comfort, which is effectual in the patient enduring the same sufferings which we also suffer. And if we are afflicted, it is for your consolation and saving health, which is effected in the enduring of the same sufferings which we also suffer; or if we are comforted, it is for your consolation and saving health. And whether we are pressed, for your comfort and salvation, being well wrought in endurance of the same sufferings which we also suffer: whether we are comforted, for your comfort and salvation. But if we are afflicted, [it is] for your comfort and salvation; if we are comforted, [it is] for your comfort that is at work in the patient endurance of the same sufferings that we also suffer. And if we are troubled, it is for your consolation and salvation, being worked out in the endurance of the same sufferings which we also suffer; if we are comforted, it is for your consolation and salvation. If I am in distress, it is in the interests of your comfort and salvation; if I am comforted, it is in the interests of your comfort, which is effective as it nerves you to endure the same sufferings as I suffer myself. 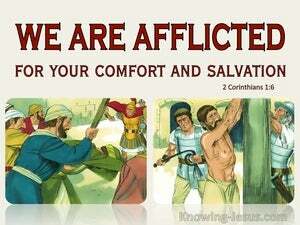 If I am afflicted, it is for your comfort and salvation; and if I am receiving comfort, it is for your comfort?? comfort produced within you by your patient fortitude, under the same sufferings which I also am enduring. But if we are afflicted, it is for your comfort and salvation; if we are comforted, it is for your comfort that you experience in your patient endurance of the same sufferings that we also suffer. But whether we be afflicted, it is for your consolation and salvation, which is effectually wrought by patient endurance of the same sufferings which we also suffer; or if we are comforted, it is for your consolation and salvation. And whether we are afflicted, it is for your consolation and salvation, which is effectual in the enduring of the same sufferings which we also suffer: or whether we are comforted, it is for your consolation and salvation. But if, on the one hand, we are enduring affliction, it is for your comfort and salvation; and if, on the other hand, we are receiving comfort, it is for your comfort which is produced within you through your patient fortitude under the same sufferings as those which we also are enduring. If I am in sorrow, it is on behalf of your comfort and salvation; if I am comforted, it is for the comfort that is experienced by you in your patient endurance of the same sort of sufferings that I am enduring too. And whether we be afflicted, it is for your consolation and salvation, which is wrought out by the patient enduring of the same sufferings which we also suffer: or if we be comforted, it is for your consolation and salvation. 5 For just as the sufferings of Christ are ours in abundance, so also our comfort is abundant through Christ. 6 But if we are afflicted, it is for your comfort and salvation; or if we are comforted, it is for your comfort, which is effective in the patient enduring of the same sufferings which we also suffer; 7 and our hope for you is firmly grounded, knowing that as you are sharers of our sufferings, so also you are sharers of our comfort. I will most gladly spend and be expended for your souls If I love you more, am I to be loved less? Therefore I ask you not to lose heart at my tribulations on your behalf, for they are your glory.